It was great fun to come home from teaching a class and to find this note. I loved sitting in snowy Holland, NY, imagining classrooms of students - across the whole world from me - reading all about ducks this term. So this one is for you, for Rose and for all of the teachers and children and duck lovers in Murray Bridge, South Australia. Thank you for the idea, and so many happy wishes to you for a celebration of ducky books over the next few weeks. I welcome you to send some of your own poems (ducky or not) to be published here in this space should you wish. Sometimes writing from someone else's idea can take you in a new direction than you might have ever found on your own. This can be a gift indeed. 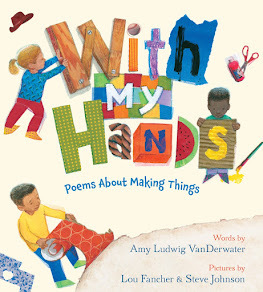 You will notice that today's poem is full of wordplay. I very much enjoyed playing with the words in this poem. I started with thinking about waddle and paddle and then just looked for more by using RhymeZone, one of my favorite little workbenches online. It's a joy to let the words burble around in my mouth sometimes, just listening to them snuggle up next to each other. And of course I like writing in the voice of another, writing a mask poem, today asa mama duck. Here is a great little clip of a duck swimming. You can really see those feet at work. 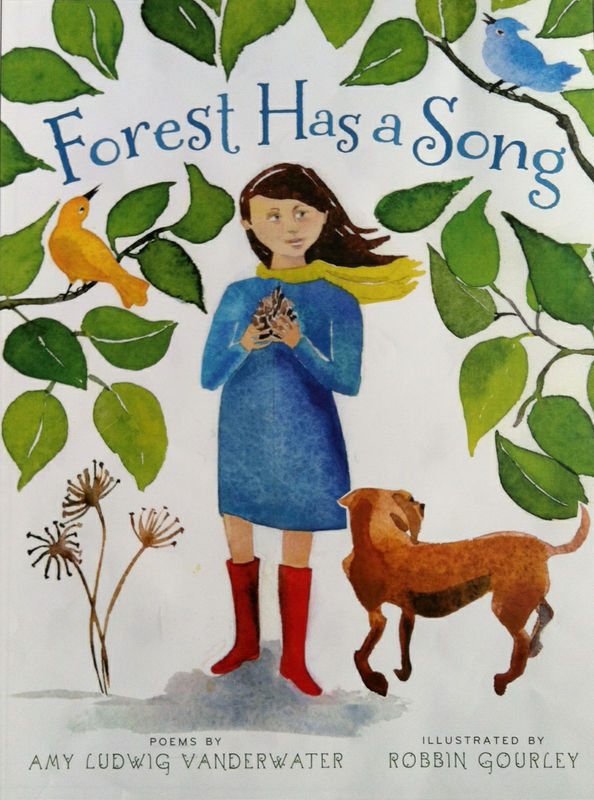 Today I am so pleased to welcome fifth grade poet Emma Trowbridge, a student of my friend, library media specialist Dr. Vida Zuljevic at Rosalind Franklin STEM Elementary in Pasco, Washington. A couple of weeks ago, Vida wrote me a note about Emma that read, in part, "Yesterday, she came to give me two new poems and I said jokingly "Emma, you are like a poetry machine" and we both laughed. Then she looked at me and said "I don't know why, but where ever I look I see a poem in it. I sit and write, and that's it!" 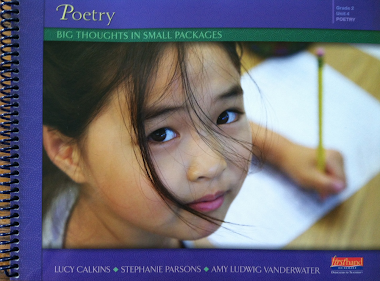 This Poetry Peek is in honor of Emma's writing and in honor of Vida's work in encouraging her. Welcome, Emma! First, none of my poems would be available without my AWESOME library teacher. She realized my talent and asked me to write more. Now a lot of people can see my poems. To get inspiration, you have to look around the world. You could write about changing seasons, maybe about your family, or something beautiful; something in your life. I love writing poems. It puts light into my life like the brightness of a burning torch. In other simpler words, it makes me happy that I can make others happy through poetry. They’ll always have a paw to lend. I have one myself. Well sort of, in a way. She’ll say she’s a dog, even though she’s not. She’s crazy, I’ll admit, but I still love her a lot. If you tell her to sit down, she will take a seat. But if she ever licks me, I swear, I’d hurl! I was busy doing my homework and my sister was bugging me. “Bark. Bark! BARK!” She wouldn’t stop barking. I knew in a flash to write a poem. and I am thankful for my dad. He has a very sharp mind. He also wears glasses, like me. in any tough or exciting situation. and that I’m thankful for my dad. My dad inspires me. He supports me and he makes me happy I decided to write a poem about someone who is special to me and that’s him. Ready for another day of fun tomorrow. I love winter. In fact, it’s my favorite season. I am inspired by the white snow. It makes me think of kittens; lots and lots of white kittens. So I wrote up this poem. and all I see are beds galore! I jump on mattresses almost piled to the top. I practically fly over just to try to rest my head. So I pass out instantly like I fell on the ground. When I walk up, I see my mom. because it’s time for my prom! I thought up something random. Sometimes, you can just go crazy with it and let your mind run wild. Just like the girl in this poem. There is a thing that has thick, brown bark. It is no dog or a great white shark. It’s not even an animal but it does still matter. The size of this thing is so very much fatter. And they all have an impact on you and me. They give us oxygen through photosynthesis. That’s not the only reason we need them so much. In a way, trees are like our wooden crutch. They give us syrup from sap and all our paper, too. So now you see the reason; I’m sure you do. We have to save them quick before they all die out. So go ahead and save the world, let out a big shout. We can all save the world, or just you or just me. Let’s save the population of the giving tree. My mom was driving me somewhere and I happened to have paper. I was looking outside and I saw a tree stump. It reminded me of trees and that’s when inspiration struck. You have just to look around. When you are looking at the ground. Or they’ll think you’re sly. Or some different ways to write. Like on the zooming speed of light! One to tickle your funny bone. At a blanket that’s neatly sewn. So write on, you’ll surely be alright. Thank you so much to Emma for sharing these rich and joyous poems and thoughts with us today. 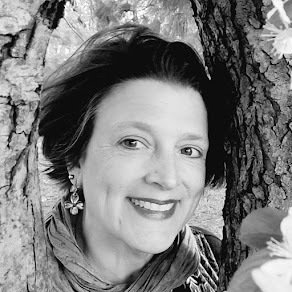 And thank you to Vida for bringing her work to The Poem Farm. Paul is hosting today's Poetry Friday roundup over at These 4 Corners. As is true each week, all are welcome to join the poetry fun, to learn new poems, find new friends. Hi Amy! 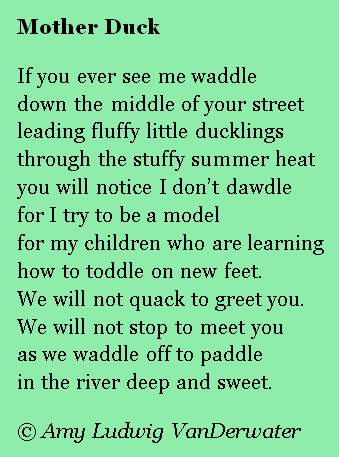 I love your duck poem! It reminds me of the ducks that would come to the West Falls library when I was a kid. Do you know if they still get ducks there? I am looking forward to your visit to Fairport this year again! "I knew in a flash to write a poem." Well done, Emma, you wise child! I loved the first poem and the playfulness, creativity and love shown between you and your sister. 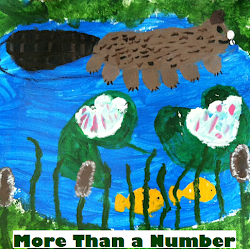 Amy, thanks for posting your duck poem and for sharing poetry written by children. I love how your rhythm changed in the two "We will..." lines of your duck poem. And that Emma, she is a miracle to behold. So young and already she knows that poetry/inspiration for writing is everywhere and anywhere you look. 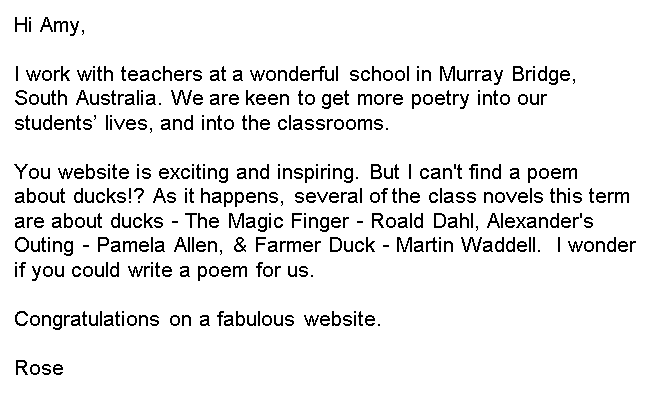 How lovely to be requested to write a duck poem! I love the image of the duck family waddling without dawdling on their way to the pond. Three cheers for Emma's poems and her ability to see poems everywhere! WOW, Emma! Keep it up!! Way to go, Emma! Keep scribbling, it will be one of the best decisions you've ever made. I promise.